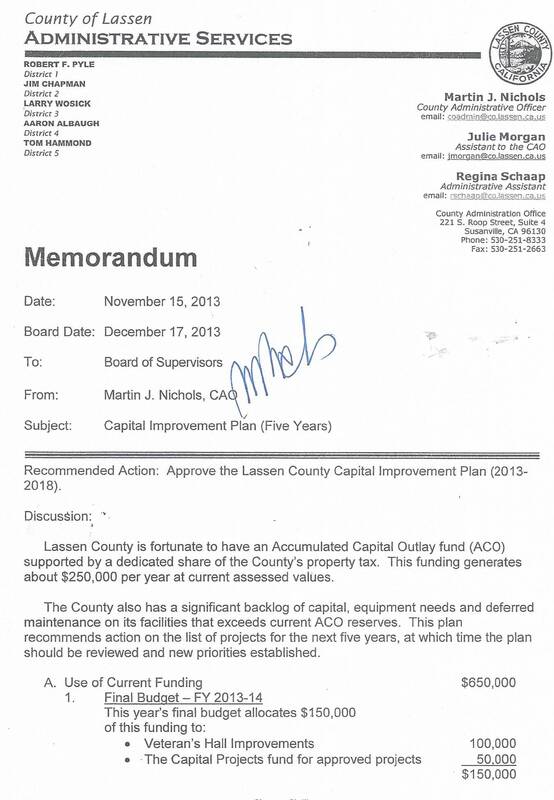 The Lassen County Supervisors must demand that the CAO prepare and maintain a "mandatory" Capital Improvement Plan. 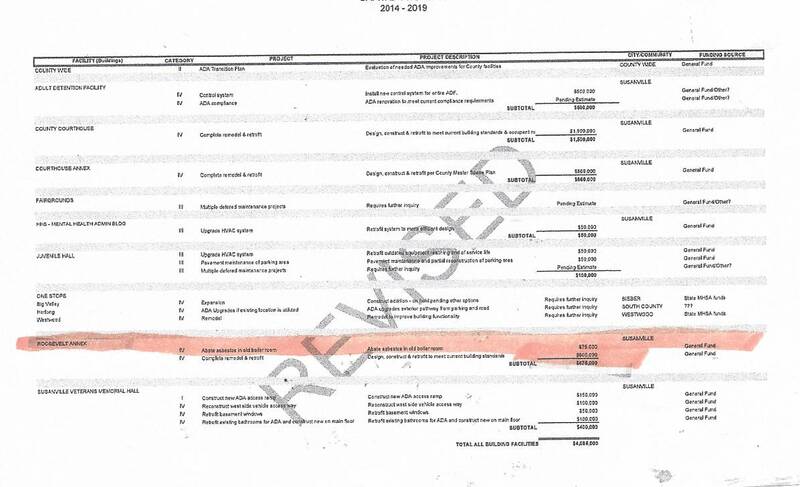 According to the County's Audit, the Supervisors never released the fact there was $4,000,000 of discretionary money in the Budget. Each year the Supervisors claim there is a $3,000,000 deficit. Is this apparently a lie they intend to use again and again and again? The County's infrastructure is crumbling and they do not know how to fix that ? 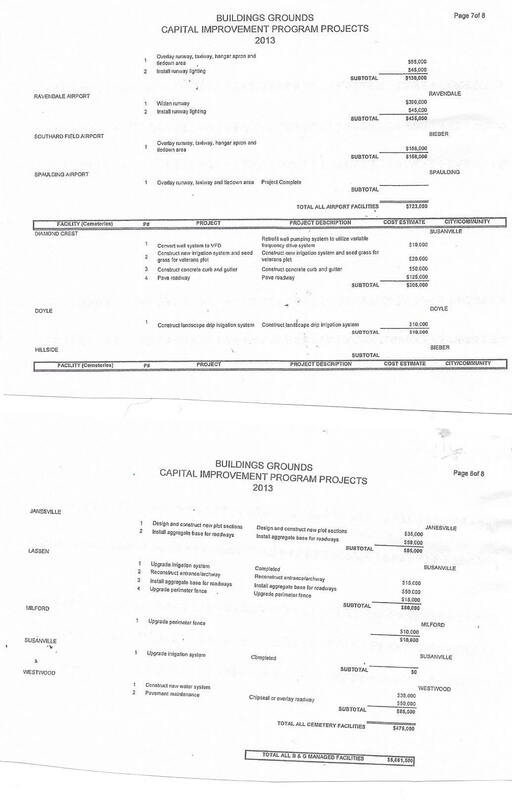 Another Draft of the Capital Improvement Plan (CIP) was presented at the September 16, 2014 Board of Supervisors meeting. 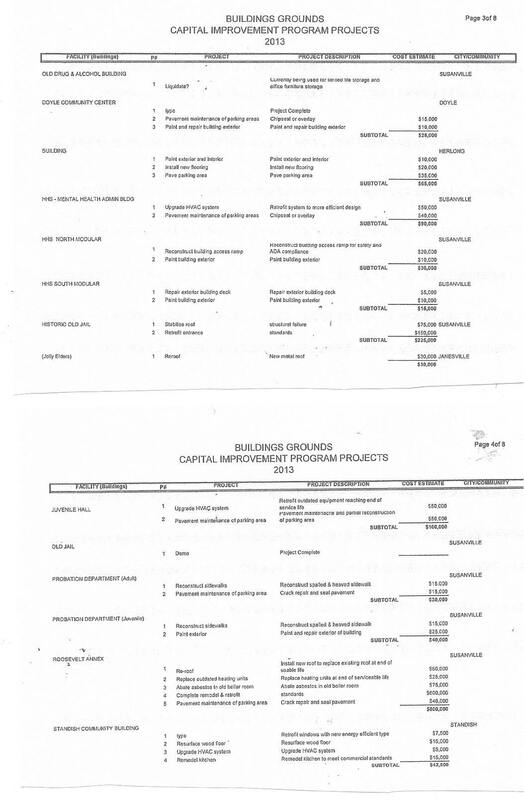 CAO Richard Egan was instructed to eliminate 80% of the actual Capital improvement projects from the spreadsheet. The eight page spreadsheet suddenly became two pages. It wasn't like the need for the improvements disappeared. The Supervisors only wanted the public to see that there was only a small amount of work to do. 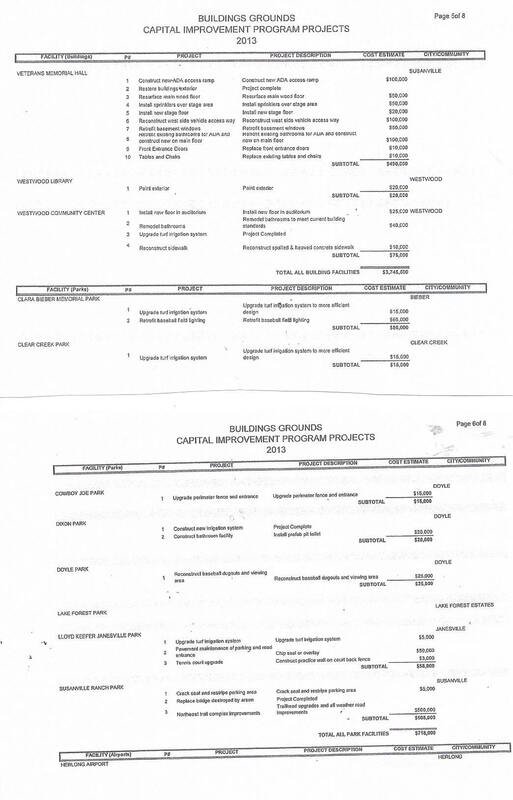 This is going to be another "Herlong One Stop"
CAO Richard Egan had Public Works present a copy of an internet sample of a capital improvement plan, at the July 8, 2014 Board of Supervisors meeting, as the real deal. Richard Egan does not have a clue how to prepare a capital improvement plan or at least he is giving a great performance of not knowing. 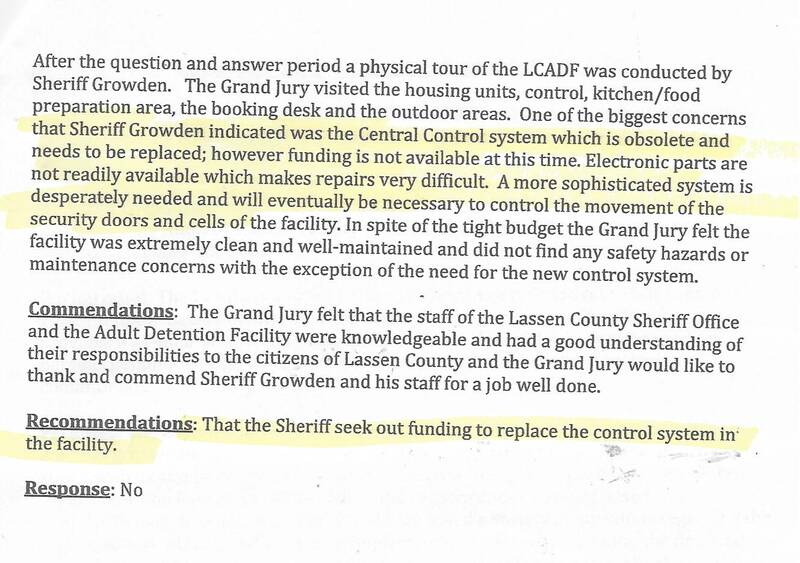 On page 38, the 2012-2013 Lassen County Grand Jury Report responded to the urgency of replacing the Lassen County Jails "Central Control System". does not have to act on this? 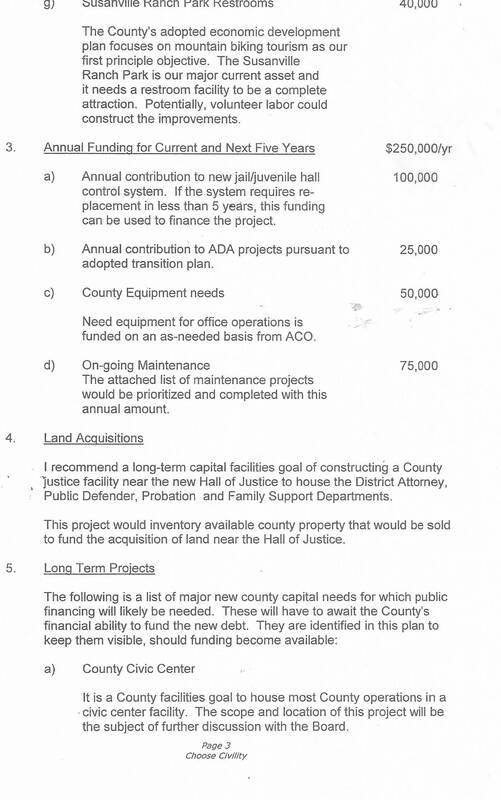 Last year, the Sheriff's Department presented the Board with a comprehensive presentation of the urgency of this capital improvement need LAST YEAR and has yet to approve the funding to be spent. This elected Board, each year, bloats their budget with funding for expenses that they never intend to approve. This accomplishes two goals. It gives the "appearance" that the County is broke and it keeps the staff thinking something is going to get done.......THIS YEAR. The facts are that this Board is a "do nothing" board. Lassen County's buildings are crumbling. 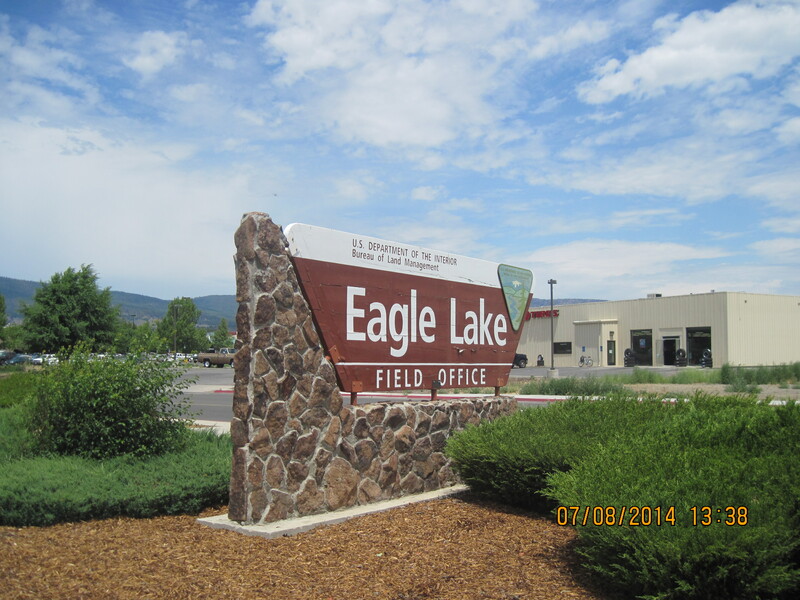 Employees are forced to work in small and bad environments, public access to county services are spread all over Susanville. 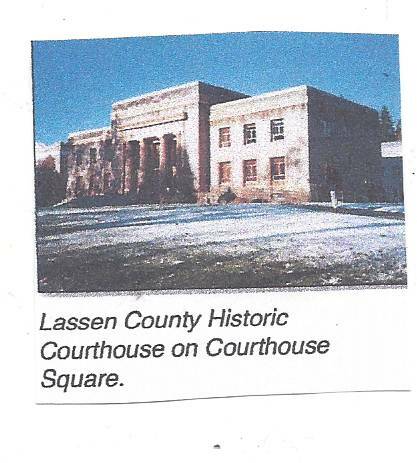 Lassen County Supervisors opened their July 8 meeting at 9:30 AM and closed the meeting at 10:30 AM.. The public still had to come back three hours later for the Capital Improvement Plan discussion that lasted one hour because Pyle didn't want to hear any more. or makes up new rules. It is very evident, according to the videos of their meetings, the 3 minute rule is extremely selective depending if they like what you are saying or not. 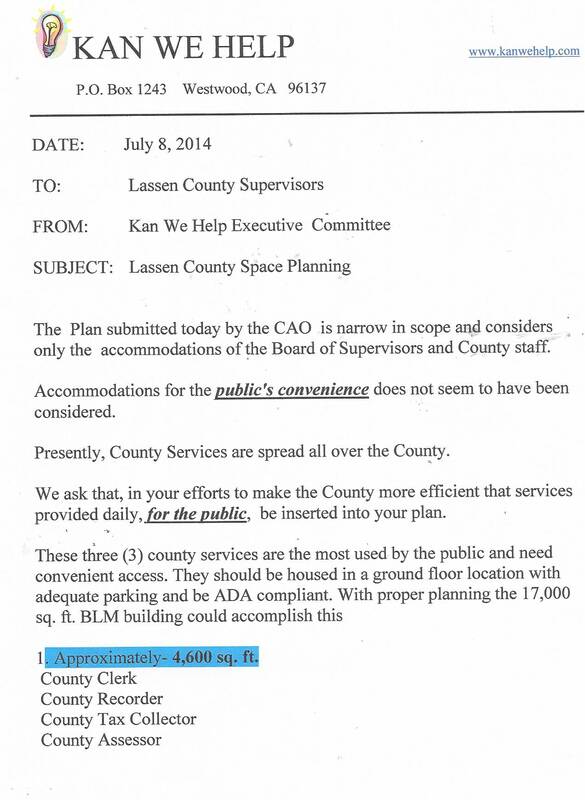 A member Kan We Help and a tax paying, voting member of the County was prepared to make a presentation on the very questionable $8,000 "Needs Assessment" Plan and the "DRAFT" CIP. 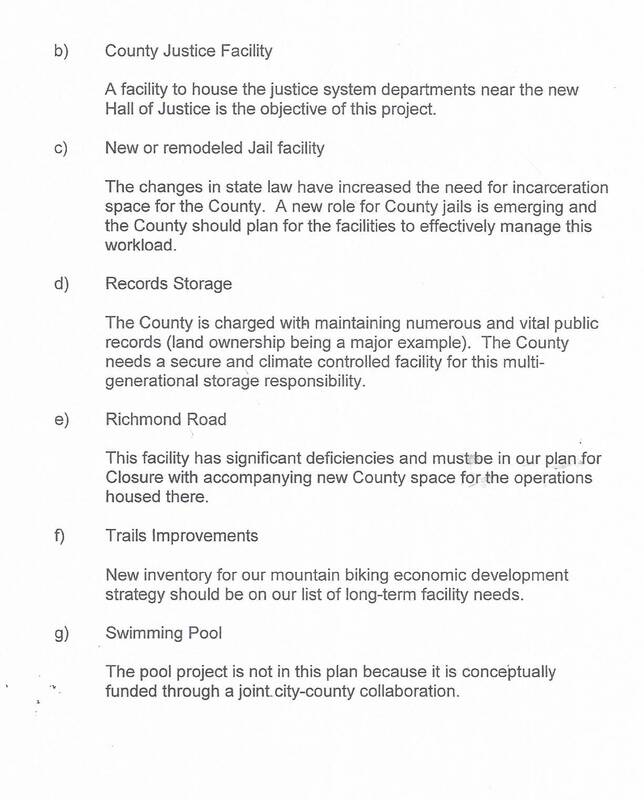 Supervisor Pyle attempted to limit public discussion to "questions only". 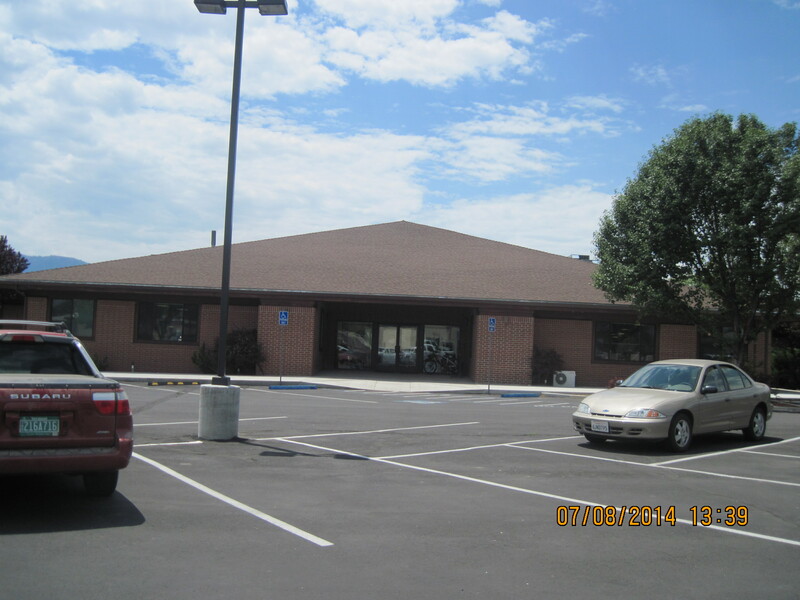 The 17000 square foot BLM building (on Riverside Drive in Susanville) will be vacant on the first of 2015. 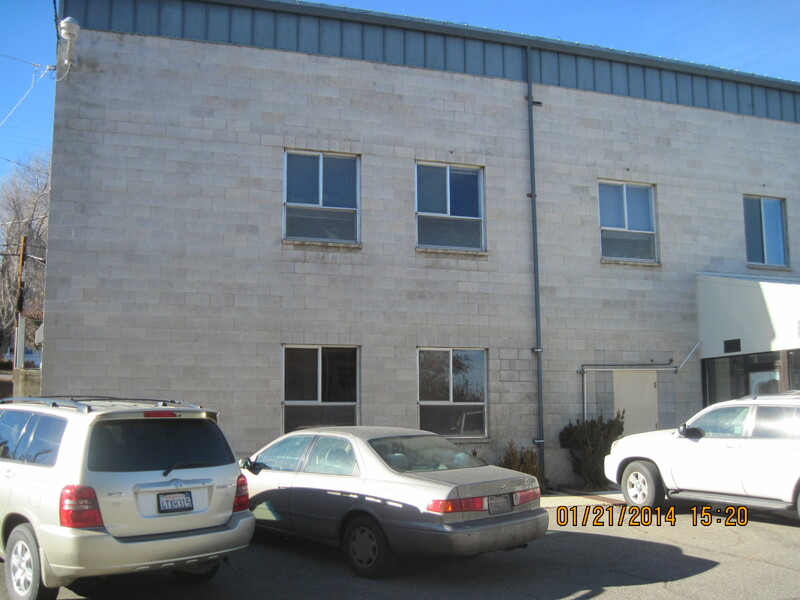 Lassen County CAO is supporting buying this property to move certain County Departments in to. Supervisor Chapman will, no doubt, be adamantly opposed to this move. THERE ARE NO COURT ROOMS INSIDE THIS BUILDING. However, he can walk down the street and visit the new Superior Court building on his lunch break. For months, Supervisor Chapman led the charge for a half million dollar new Supervisors Board Room. 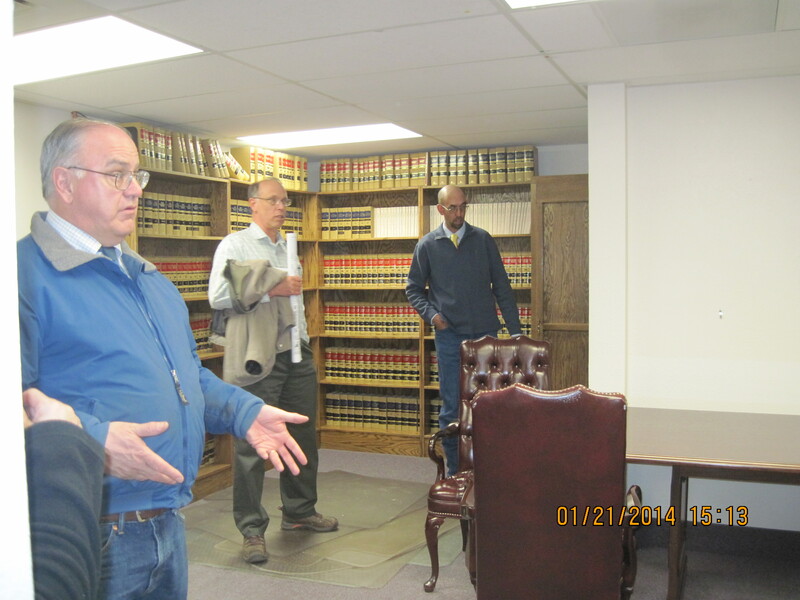 There was no money for this project, but on January 21, 2014 Supervisor Chapman, ordered Jeff Morrish, from NST (without public discussion or Board approval) to draw up plans for "The Annex" below [Judge Sokol's Department 1 court room] to be transformed into his new Board room. 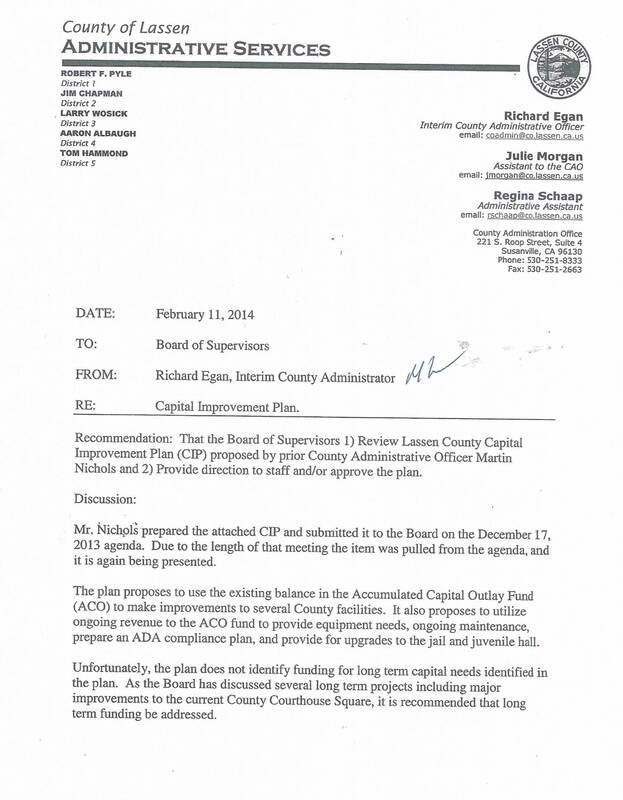 On January 21, 2014, Chapman ordered the work to begin immediately and to be completed by June 10, 2014. KEEP IN MIND, THERE IS NO MONEY. 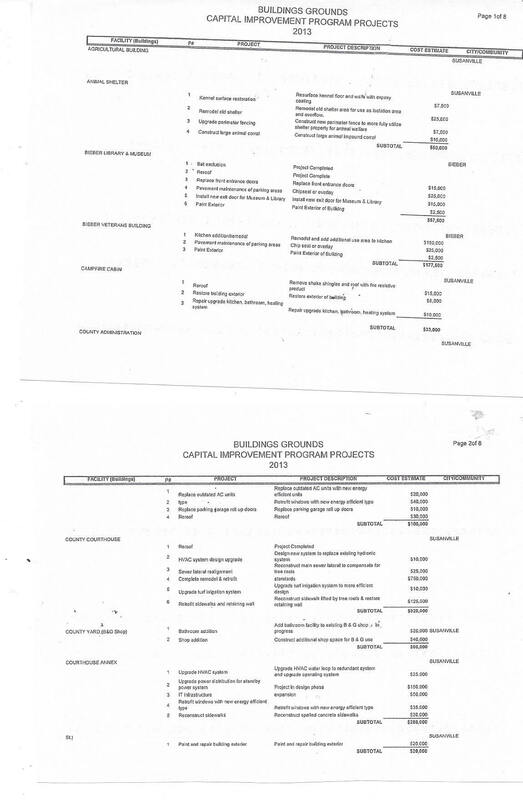 NST spent $20,000 on plans that were never going to be used. WHY? 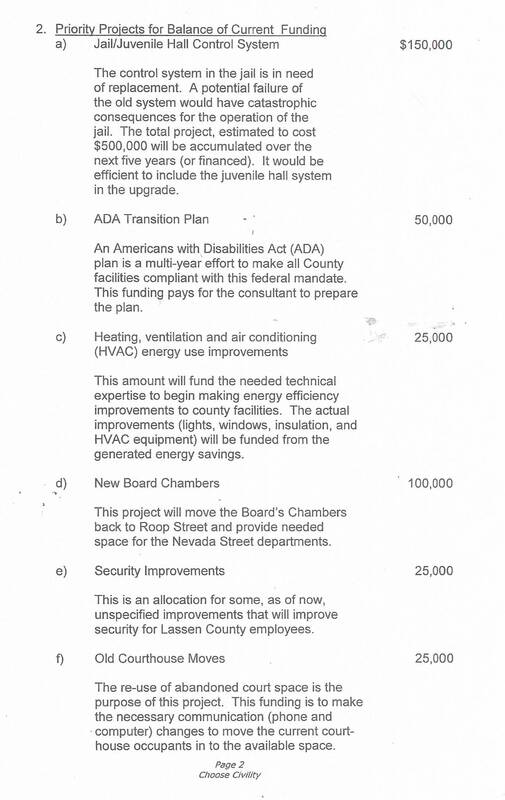 The Lassen County Board flew $$$ TRG's Harry Munyon $$$ from Palm Desert, CA to present an "alleged" "NEEDS ASSESSMENT" study. This Study was commissioned two years ago at a cost of $8,000. 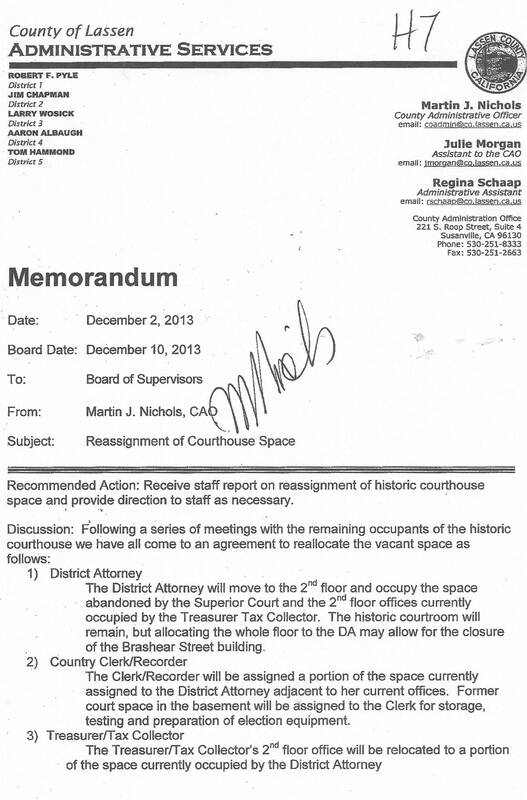 Two years ago "someone" decided that the new Board room will be in the Old Court House on Lassen Street. 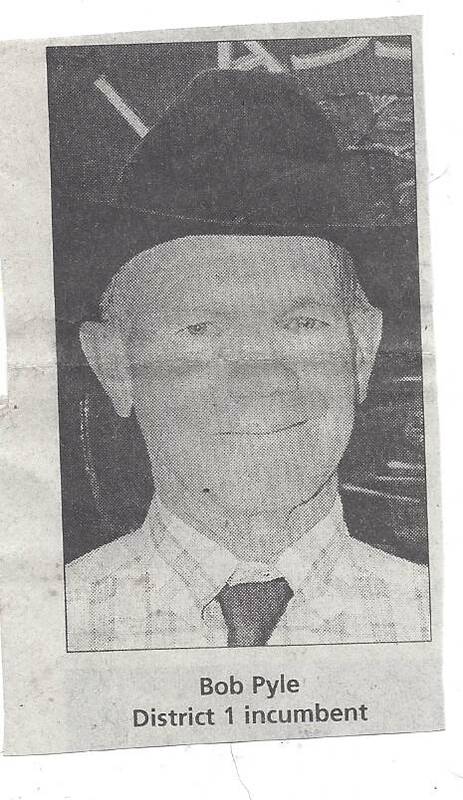 The NST farce was an intentional deception by the CAO and Supervisor Chapman. IS HONESTY TOO MUCH to ask from these people? Supervisor Albaugh seemed genuinely surprised when it appeared that a decision to remodel the old courthouse and move the Supervisors in to it had already been made. 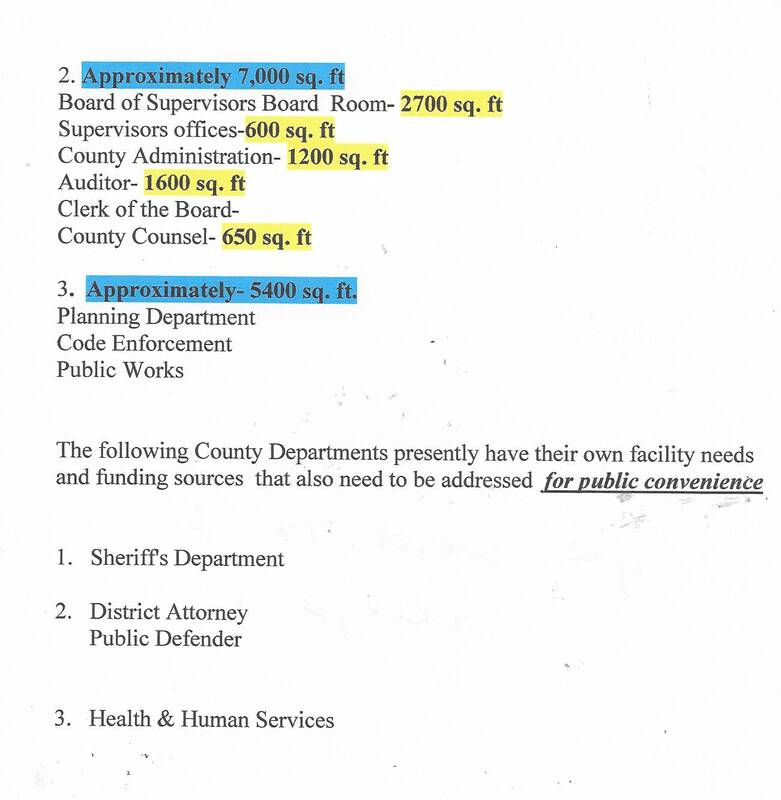 Considering the fact that on December 10, 2013, the Supervisors intended to move the District Attorney into that space. The same space the Supervisors want to chop up for their 'NEW BOARD ROOM"
The CAO was asked if the decision to remodel the historic upstairs courtroom (into a Supervisors Board room) came from Supervisor Chapman's "COURTHOUSE SQUARE REVITALIZATION TASK FORCE". The CAO attempted to "not know" about this committee but finally was forced to reveal that Chapman's task force has never had even one meeting. This is not a Capital Improvement Plan.